A couple of months ago I purchased both of Summer Fridays masks, the Jet Lag Masque and the Overtime Masque from www.sephora.com. I had heard so many good things about them, I wanted to see what the hype was all about. I'm glad that I did. Both of these masks are exceptionally well made for their duties. Today I am reviewing the Overtime Masque. Does your skin ever just feel dull or congested? Kind of not up to par with what you are used too? My skin has been feeling this way ever since I started Retin-A and Niacinamide from www.forhers.com. It's am online Rx service whereby you correspond with a physician and he gives you a 12 month script for Retin A with either clindamycin and Niacinamide or just Niacinamide alone. I've been on the Retin-A (tretinoin) cream a month now and my skin has been breaking out a oot on the chin and it's peeling on my nose, chin and face. It looks awful but this is the price you pay to not have line and wrinkles. So today to brighten up my complexion and get rid of someo of the congestion I decided to use the Overtime Masque again. This mask is perfect for my situation. I have a lot of congestion in my chin right now. My skin cells are shedding too quickly right now because of the Retin-A and they are getting caught in the hair follicles, thus causing acne lesions. The Overtime Masque uses vitamin-packed pumpkin and exfoliating apricot seed powder to gently polish away dead skin cells for a luminous effect. To use, apply to dry, clean skin. Apply a thick layer using fingertips. Massage in a circular motion for 60 seconds. Avoid eye area. Leave on for 10-15 minutes then rinse off with warm water. Dry skin and apply moisturizer. After removing the mask, my skin feels amazing. Soft, smooth and rid of all of the dead skin cells that were congesting my skin. I just need a light moisturizer to aid in the dehydration of my skin that accompanies using Retin-A. Otherwise, this mask is perfect. I adore it and think that the Jet Lag Masque is a nice accompaniment at night. 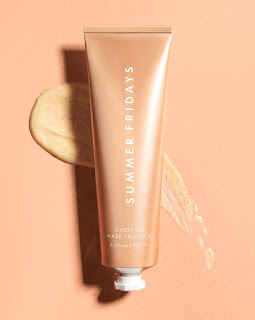 Summer Fridays Overtime Masque is available from www.summerfridays.com and www.sephora.com. Like Summer Fridays on Facebook: http://facebook.com/summerfridaysbeauty; Follow Summer Fridays on Twitter: @summer__fridays and Follow Summer Fridays on Instagram: https://www.instagram.com/summerfridays/.